Dogs are widely regarded as man’s best friend, so it’s only natural that we want to spoil them from time to time. However, as with humans, a few treats here and there can soon begin to pile on the pounds, which can lead to weight gain and put unnecessary strain on your dog’s joints. How does being overweight impact a dog’s joints? According to the Pet Food Manufacturers Association (PFMA), vets believe that 49% of dogs in the UK are overweight/obese. Carrying additional and unnecessary bodyweight puts extra strain on your dog’s joints. As this progresses, key components of the joints, such as synovial fluid which keeps joints moving smoothly, and cartilage, which cushions the ends of bones, can break down, causing your dog pain and resulting in restricted movement. This winter Beaphar is encouraging owners to make a #JointResolution with their pets; looking after their pets joints as they would their own. As part of this you could choose to make your dog your workout buddy, and work towards getting fit, staying healthy and supporting your joints together. Alongside keeping you both fit and healthy, your #JointResolution will help strengthen the bond between you and your dog, and keep both of you moving in the right direction. You see your dog everyday so at a casual glance you might not notice if they’re carrying a few extra pounds; you may only become aware of it when a vet points it out during a check-up. If you find you can no longer feel your dog’s spine or they are being less active than usual, they are probably carrying extra weight. You could use the Size-O-Meter on the PFMA website ( https://www.pfma.org.uk/pet-size-o-meter) to help you identify whether your dog is the correct weight, but if you’re still unsure you can always consult your vet, who will also be able to offer guidance on nutrition and weight loss. Really the solutions for solving your dog’s weight problems, and therefore reducing the strain on their joints, are the same as solving a human’s – diet and exercise. Not overfeeding your pet and getting out and about will help your dog sustain a healthy weight. However, before making any changes to your dog’s diet or exercise regime you should consult your vet – they will be able to advise you on the correct nutrition and exercises suitable for your dog. To help your dog maintain a healthy weight it’s important to follow the feeding guidelines on your dog’s food, or the advice of your vet if your dog has been given a nutrition plan to help them lose weight. Obviously getting the scales out for every meal isn’t ideal, so why not try a simpler solution? After weighing the correct amount of food, pour it into a disposable cup and use a pen to mark the amount, now you only need to fill the cup up the line. Just as humans are guilty of adding extra calories to their diets by snacking, giving your dog too many treats in addition to their normal food will just undo a good diet. That being said, you don’t have to eliminate treats completely, you just have to remember to include them in your dog’s overall meal plan. If you feed your dog a dry kibble diet you could remove a small amount from your dog’s meals and give them as treats throughout the day, otherwise try to choose treats that will give your dog some benefit. 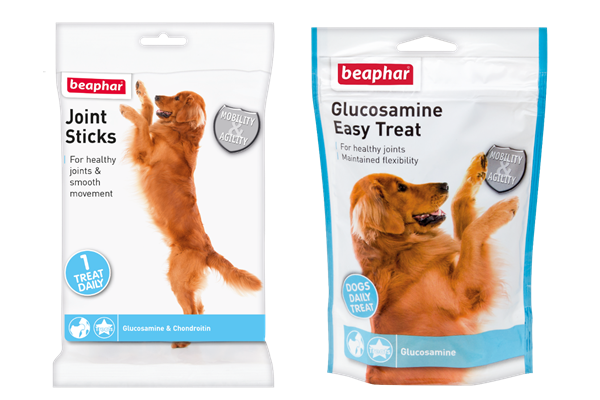 Beaphar Glucosamine Easy Treat and Beaphar Joint Sticks both help with the development and maintenance of tendons, joints and connective tissues. Both contain Glucosamine which aids the production of collagen, helping to rebuild joint tissue. Beaphar Joint Sticks also contain Green Lipped Mussel which is used in human healthcare due to its anti-inflammatory properties. A single joint stick can also be easily broken up into smaller pieces so it can be given to your dog as several treats throughout the day. Most importantly make sure everyone in the house is on board with the plan, it’s no good carefully measuring your dog’s portions and limiting their treats if other members of the household are slipping them extras when you’re not looking. Keeping your dog active will help combat obesity. Something as simple as taking your dog out for a walk and playing fetch will help keep your dog fit and healthy. Before beginning an exercise regime with your dog you should consult your vet to make sure your dog doesn’t have any health problems that may be adversely affected by your chosen activity. If you are unsure what exercises to do with your dog, your vet can also give you advice.